Polpenazze del Garda is located on the hills of Valtenesi green, but only 4 km from the lake. Thanks to its location you can easily reach beautiful cities such as Verona, Venice, Padua, Mantua and Bergamo with its striking Upper Town, numerous archaeological sites, renowned spas, theme parks and botanical gardens. A short distance trails for trekking, Nordic walking, mountain biking and horseback riding. For golfers the Garda Golf Country Club in Soiano del Lago features a 27-hole putting green where you can spend the day. For gourmets wide choice of restaurants, taverns, wine cellars with tasting of local products and local and international cuisine. We're Corrado and Chiara, we love to meet people from other countries and cultures, travelling and new experiences. We live by the Lake and we love to promote its beauties. Clare has a great propensity for hospitality and welcome, so we decided to take care of the management of two apartments, initially purchased as our future abode, and give the opportunity to others to stay in this lovely place. We also have other solutions in its neighbors. PALAZZO SCOLARI POLPENAZZE DEL GARDA is a historic mansion used as his time to winemaking and the manufacture of silk originally consisting of mansion and buildings satellite used as stables, cellars and staff quarters. It was created a remarkable restoration from truly unique result that led to the creation of some apartments, two of which are the subject of our proposal. The apartment is part of a nicely renovated building in gated development and is clean and comfortable and ideal for 4 people though would be crampt with 6 if using sofa bed. Well equiped with dishwasher, microwave, kettle, toaster, and oven worked well for those self catering. Brits may wish to take a can opener and oven mits and tea pot if so inclined. Useful to have pool towels provided and pool is large and shallow and quiet most of the week as many residents appear to be weekend visitors. Garage for the car is also useful as car is kept secure and cool. Located in the old part of Polpenazze the apartment is close to a few small shops including a very nice Gelateria. It is quite a busy place and there is some road noise and also the nearby clock tower chimes every half hour throughout the day and night but you get used to both after a few days. Our host Corrado provided a tour of the facilities and relevant information about the property. He also suggested local places to visit and advice on local supermarkets. Enjoyed a visit to Venice, and to the Palace at Mantova which he suggested. Also very accommodating with booking and dates we wanted. Our family of 4 stayed in the two bedroom apartment for 8 nights and really enjoyed the apartment, the town, and the location on the lake. Our two sons, ages 12 and 15 had a great time. Having only one bathroom is sometimes an issue on vacation but somehow because it's large, nicely appointed, and with large window to the quiet courtyard, we didn't notice it. We only cooked a few times and were able to do everything We needed to with the items provided. A more serious cook may need a few additional pieces of equipment. The apartment is cosy, light, quiet and very clean. Sat TV had copious number of Italian channels but no English or German...although this didn't bother us. The wifi was working, but fairly slow....again we were not there to hang out on the Internet. Corrado did say they will be upgrading that situation soon. The pool was really lovely and the gardens are impeccably kept. Having a private garaged space for our car was great too. In the town, it's quiet but quaint with all the necessary small shops for your basics, bar, and incredible gelateria. This village is really close to many lovely "beach" towns, manerba, moniga, San Felice, S alo, etc. we also visited some hill towns, sirmione and had so many wonderful meals truly. Corrado's recommendations were perfect. We rented a boat twice from a company called rappydrive in Moniga...very well organized and affordable. The lake must be experienced from the water too, water is so nice and clean. We spent some time renting paddle boards at the beach in Pisenze on our last day which was great fun. Well, hope you can tell we loved staying at this apartment and really enjoyed our trip. Thanks Corrado and Chiara. Leuke accommodatie in het hart van een echt Italiaans dorp. We hebben een leuke week gehad in dit complex. We zijn halverwege geswitch van apartement 5d naar 6d omdat we last hadden van het geluid op straat e.d. Apartement 6d ligt aan de tuin en het zwembad en dat was veel rustiger. Het apartement is gezellig ingericht met mooie kleuren en van veel gemakken voorzien. Corrado reageerde heel snel en zijn ontvangst was prettig. Polpenazze is een echt authentiek Italiaans dorp. We hebben regelmatig gebruik gemaakt van de Gelateria, heerlijk ijs. Good morning Karl and many thanks for your positive review. I notice that there are improvements suggestions that I will take in due account, however I would like to clarify a few points. 1) the making of the bedding when the guest is in the apartments is not allowed by our laws otherwise we should register as bed and breakfast but since we do not live in the same building this would not be allowed. the change by the way is not foreseen in our contract and is a courtesy. 2) we normally keep in touch and follow up with our guests using whatsapp and telegram: you did not have any of the two available to quickly exchange communications. Finally , we tend not to be invasive in the privacy of our guests while they are on holiday : we had a storm that did not make any damage to the property so I honestly do not understand why I should have contacted. Wir (2 Erwachsene und 2 Kinder im Alter von 10 und 13 Jahren) verbrachten 10 sehr tolle und erholsame Tage in Polpenazze. Die Wohnung bietet alles was man für einen angenehmen Aufenthalt braucht. Handtücher und Wäsche waren ausreichend vorhanden, in der Küche wurde ebenfalls nichts vermisst. Die Wohnung und auch die gesamte Anlage machen einen sehr gepflegten und neuwertigen Eindruck. Absoluter Höhepunkt ist der große Pool im ebenso gepflegten Garten, der die Distanz zum See von lediglich 5 km wett macht. Der Kontakt zu den Vermietern war absolut problemlos und wir bekamen viele hilfreiche Tipps zu Restaurants und ähnlichem. Die Ortschaft selbst ist von Touristen praktisch unberührt und bietet eine tolle Eisdiele, einen Bäcker und einen Gemischtwarenladen. Wir können die Wohnung auf jeden Fall weiterempfehlen und werden bestimmt wieder einen Urlaub dort verbringen. Ein kleiner Wermutstropfen bleibt: wegen der fehlenden Klimaanlage kann es bei heißen Sommertagen warm in den Zimmern werden, aber es stehen in jedem Zimmer ein Ventilator zur Verfügung. In the context of a prestigious and recently renovated historic home, we have two apartments finely furnished. The property is set in a large garden planted with olive trees and native species in an island of peace in the center of the country. 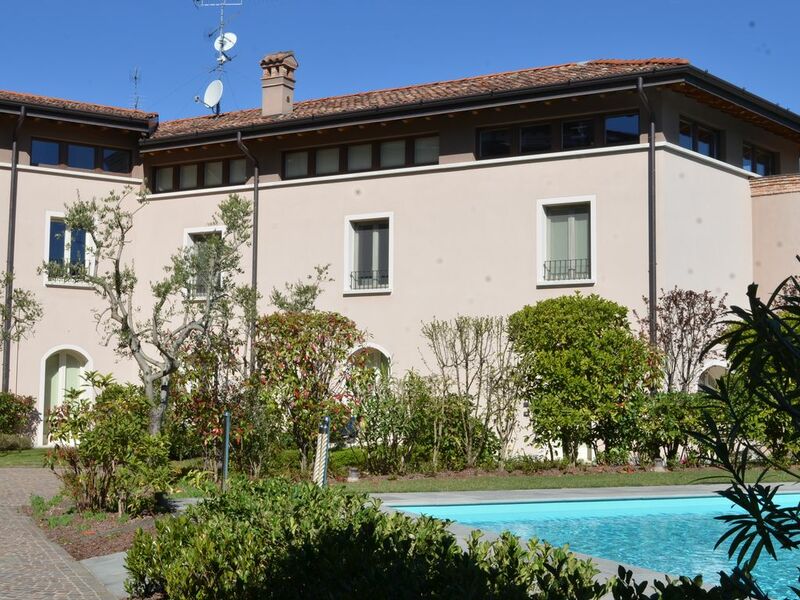 Available to guests a large swimming pool with Jacuzzi, sun beds and exclusive garage, just a few steps away are: baker, butcher, greengrocer, hairdressers, ice cream parlor, post office, bar, pizzeria, church, library, and playground. Along the road of wines and flavors that crosses the Valtenesi meet cellars and oil mills open to the public where you can buy locally produced olive oil and wine. The landscape offers glimpses of extraordinary beauty: olive groves, vineyards, cultivated fields, small woods, lakes framed by the enchanting panorama of Lake Garda.